What additional steps can I take to improve account security? Check out the Harvard Information Security guide to security awareness to learn more how you can keep yourself and Harvard more secure — and consider taking these two steps right away to make a big difference. Read more about What additional steps can I take to improve account security? Why do I need to log in to access some Harvard resources? Many online resources within the Harvard Community require verification of your identity before granting you access. By supplying a login name and matching password, you can verify, or authenticate, your identity. In order to reduce the number of credentials that you need to remember, HarvardKey acts as a unifying credential verifying your identity across Harvard without the need for multiple ID/password pairs. Who is eligible for access to protected Harvard resources? Read more about Who is eligible for access to protected Harvard resources? HarvardKey is Harvard University’s unified credential for accessing a wealth of University applications and services with a single, convenient login name and password. In addition to enabling access to the Harvard applications and services you use every day, HarvardKey also offers an easy-to-use self-service portal for managing your account, including changing your password and updating your recovery information in case you forget your login details. HarvardKey also provides optional two-step verification to keep you even more secure. Read more about What is HarvardKey? Over the autumn and winter of 2015-16, full HarvardKey functionality will be rolled out to users across the University Community. 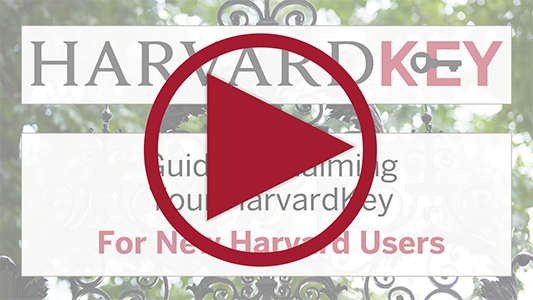 Visit the HarvardKey news page to see the latest updates to the rollout schedule. Read more about How do I get my HarvardKey? Are there guides to walk me through claiming my HarvardKey? Yes! Choose the user type that best describes you in the boxes below. New students, faculty, and staff who have never previously held a Harvard affiliation. Read more about Are there guides to walk me through claiming my HarvardKey?